No. 1 seeds Santiago Gonzalez and Scott Lipsky win second doubles title together 6-4, 6-3. 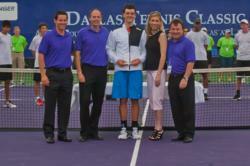 The Dallas Tennis Classic crowned its inaugural champion today, Canadian Frank Dancevic. A qualifier, ranked No. 175 in the world, Dancevic won his first tier two caliber ATP Challenger tour event with a 7-6(4), 6-3 victory over Russian, Igor Andreev. In the doubles final the No. 1 seeded team of Santiago Gonzalez of Mexico and American, Scott Lipsky were triumphant against the American duo of Bobby Reynolds and Michael Russell. The finals were aired on TXA 21 hosted by Bill Jones and included color analyst and Four Season’s touring tennis pro, Craig Kardon. Dancevic came into the tournament as a qualifier ranked No. 175 in the ATP rankings, and played six matches en route to the finals. Dancevic made tennis history last year by becoming the first player to play his way through qualifying into the main draw of all four Grand Slam tournaments in a single calendar year. Dancevic had two qualifying matches prior to reaching the main draw defeating Mikhail Elgin (RUS) and Maxime Authom (BEL). In main draw action, Dancevic went on to beat Qualifier, Alex Kuznetsov (USA), fifth-seed, Yen-Hsun Lu (TPE), first seed, Marin Cilic (CRO) and received a walkover in his semi-final match, when former world No. 2 Tommy Haas had to withdraw before the start of the match due to thoracic pain incurred in the warm-up. Dancevic and Andreev have now played three times in their careers, with Dancevic taking a 2-1 lead in the head-to-head matchup. No. 1 seeds Santiago Gonzalez and Scott Lipsky have played together in four tournaments in the last year, and this win marks their second doubles title. They had a great week of wins against, Bernardo Carberol (ARG)/Yen-Hsun Lu (TPE), Adham El-Effendi (USA)/Darren Walsh (GBR) and Alex Kuznetsov (USA)/Mischa Zverev (GER). The Dallas Tennis Classic is a Challenger Level Tour event with Prize Money of $125,000. The event features a 32-player singles draw and a 16-team doubles draw. Unlike other Challenger events, top 50 ranked players can play in the Dallas Tennis Classic, without obtaining a wildcard, as they prepare for the Sony Ericsson. The ATP Dallas Tennis Classic is an International-level Challenger event governed by the Association of Tennis Professionals (ATP) offering $125,000 in prize money. The event will feature 32-player singles draw and a 16-team doubles draw. The inaugural event in Dallas will be held between the BNP Paribas Open in Indian Wells and the Sony Ericsson Open in Key Biscayne, Florida. The charitable beneficiary of the Dallas Tennis Classic is Invest in a Child, a Dallas Tennis Association (DTA) charitable program. For more information about the Dallas Tennis Classic Four Seasons Dallas at Las Colinas go to the tournament’s website at DallasTennisClassic.com or follow the tournament on Twitter or Facebook.